The Tesla Model 3 has been billed as Tesla’s mass-market, affordable electric sedan, but with a bunch of fancy options, the car can easily get into the high $70,000-range. Even then, Consumer Reports found some issues with it that keep it from earning a Consumer Reports recommendation. However, Tesla claims that its braking figures aren’t as bad as the famous publication says. In its report, the outlet found “flaws—big flaws” in the Model 3's braking distance, controls and ride quality. In CR’s testing, Model 3's braking distance from 60 mph was 152 feet, a distance that the outlet claimed is “far worse than any contemporary car [it has] tested” and was nearly seven feet longer than the braking distance than that of a Ford F-150. To conduct the braking test, testers make sure a car’s brake pads and tires are up to par, drive the car up to 60 mph and slam on the brakes to record the distance. They do this multiple times and, of course, they let the brakes cool between tests. In our testing of the Model 3, the first stop we recorded was significantly shorter (around 130 feet, similar to Tesla’s findings), but that distance was not repeated, even after we let the brakes cool overnight. In our tests of both Model 3 samples, the stopping distances were much longer than the stopping distances we recorded on other Teslas and other cars in this class. Additionally, CR’s testers found issues with the Model 3's big center touch screen. Because most of the car’s controls can be accessed through this screen, the interior of the car is pretty minimalist: very few buttons, dials and gauges on the inside surfaces. When trying to perform tasks like messing with the AC and adjusting the mirrors, the testers had to use that touch screen alone. That’s too complex and distracting, CR argued, forcing drivers to take their eyes off the road to operate. And finally, the “stiff ride, unsupportive rear seat and excessive wind noise at highway speeds” didn’t do the Model 3 any favors. The outlet argued that other competitors in the compact luxury sedan segment have a better ride quality and more comfortable rear seat. The testers did find the Model 3 to be exciting to drive, at least. And the car managed to set a CR range record, going 350 miles on a single charge. This was the longest distance that CR ever tested with an electric car. 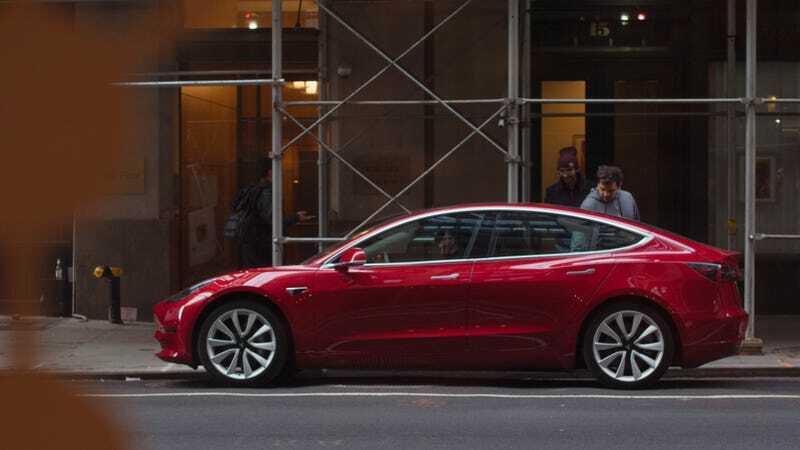 Despite that, though, Consumer Reports concluded that the Model’s problems outweighed its pros and couldn’t give it a recommendation, kind of an unexpected outcome for such a hugely important (particularly for Tesla) and extremely hyped vehicle. Tesla has been working like mad to even build Model 3s on time. You don’t want to put in all that effort for a car only to get not recommended by CR. You can read the full story here and the full road test here.